This illustrates the pervasive nature of Hizbullah’s network. If this can be figured out by MEMRI, why can’t it be figured out by our government? They can destroy it in a second if they had the will However, there is no will. Conservative hackers should target these sites. Conservatives from around the country should boycott the US based ISP’s used by these terrorists. Our crusade can begin right here at home. Over the past few years, MEMRI has released a series of reports documenting the Lebanese terrorist organization Hizbullah’s online activity (see Appendix I). These reports followed Hizbullah’s launch of new websites for its leadership, for its television channel and radio station, for news, and even for video games that it created. Many of these websites were hosted on ISPs in the West, and especially in the U.S.
As MEMRI’s research has highlighted, following the launch of Hizbullah’s many websites, the organization expanded its online activity to social media, with multiple accounts on YouTube, Facebook, and Twitter. These accounts’ followers number in the hundreds of thousands. It should be noted that Facebook has removed numerous Hizbullah accounts, but that Twitter and YouTube have not. Most recently, Hizbullah’s online activity has spread to mobile applications. Hizbullah apps can be downloaded and purchased from the Apple iTunes store and from Google Play. Another way Hizbullah is now using apps is with the highly popular WhatsApp mobile messaging service, which was recently purchased by Facebook. In fact, the creator of Al-Manar’s app has also created apps for Sky News TV, France 24 TV, and BBCArabic Live TV, among other notable media outlets. 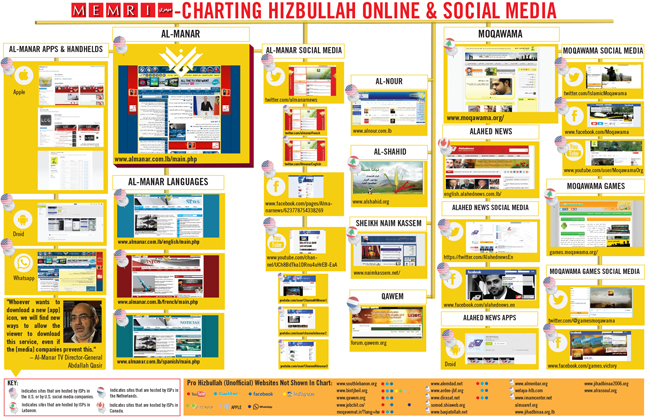 via Tracking Hizbullah Online – Part IV: Websites Hosted In Ohio, Florida, Michigan, Illinois, Colorado, Texas, California; On Social Media, Including Facebook, YouTube, Twitter – And WhatsApp; Apps Available From Apple Store, Google Play For iPhone And Android.